I often see the Volk­swa­gen 1.9TD ABL engine being put down as slow and poor qual­i­ty, often fol­lowed by advice from oth­ers to swap out to the 1.9tdi engine which gives bet­ter econ­o­my and smoother run­ning but I for one am very hap­py with the 1.9td engine in my T4 and I hope to explain why here. Grant­ed, the engine is not qui­et, it’s prob­a­bly the nois­i­est post air cooled engine Volk­swa­gen have pro­duced. It’s also slow when set up as stan­dard, but there are ways around that. As for being eco­nom­ic, no it’s not that either real­ly, I typ­i­cal­ly get around 30 miles to the gal­lon. How­ev­er, with a bit of mod­i­fi­ca­tion and change of fuel, the 1.9td can become a great engine. 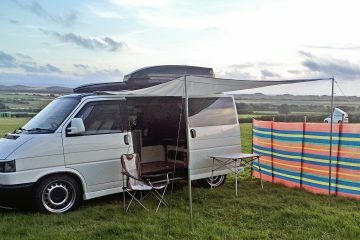 Before chang­ing any­thing on my van, hills were a night­mare. 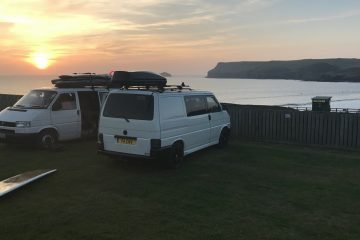 Trips to North Devon or Corn­wall often meant being over­tak­en on every hill with the speed drop­ping down to around 50mph on many occa­sions, hav­ing to change down to 4th gear to get any kind of pull. That’s not to say it didn’t have torque, no mat­ter how many pas­sen­gers or heavy the load, the speeds were always the same, just unfor­tu­nate­ly that was slow. There are a cou­ple of hills east­bound on the A303, a friend and I use to call Hill of Despair I and II, but no longer. The eas­i­est mod­i­fi­ca­tion to make is to the tur­bo. This is done by adjust­ing the actu­a­tor arm to make it short­er which means the waste gate will not open until the pres­sure is high­er, giv­ing a lot more boost. There are a few in depth guides avail­able on the Inter­net to do this. You do need to fit a boost gauge in order to ensure you do not over­boost and there­fore cause cat­a­stroph­ic dam­age to your engine. Mine was fit­ted in place of the haz­ard switch, the haz­ard lights are now con­trolled by a switch from a Pas­sat, as can be seen in the pic­ture below. 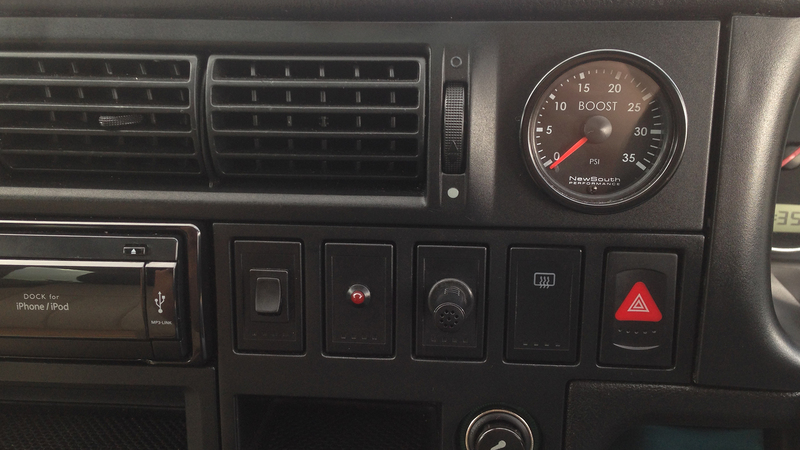 The hose for the boost gauge just needs to be fit­ted where the pres­sure can be read and for­tu­nate­ly there is a place for that on the air intake as shown in the image below. 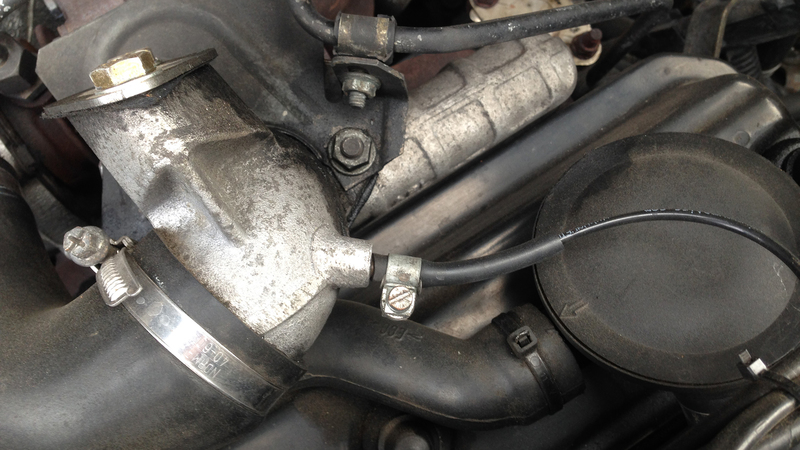 The image also shows anoth­er mod­i­fi­ca­tion and that is the removal of the EGR valve, how­ev­er, to be hon­est this makes lit­tle dif­fer­ence. Mine was removed due to a fault in the fuel pump which was not oper­at­ing it any­way. With­out mod­i­fi­ca­tion the tur­bo should give a read­ing of around 9 psi, so if this is the case you can then go ahead and adjust the actu­a­tor arm to increase the boost. Note that the boost only occurs under throt­tle. Do not exceed 14/15 psi as you may put too much strain on the engine, mine nev­er exceeds 13 psi. This change will make a lot of dif­fer­ence. Next, the fuel pump. 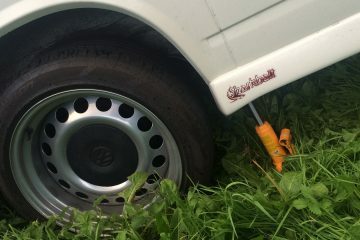 At first I adjust­ed this myself by remov­ing the lock­ing nut on the max fuel screw but I could not get the idle to sit right so in the end I went to some­body who could check the tim­ing. The whole process cost just £60 and I would rec­om­mend his ser­vices to any­one, please con­tact me if you need details. The change this made was real­ly quite dra­mat­ic, accel­er­a­tion increased tremen­dous­ly and this was what allowed me to climb hills at a sen­si­ble rate. Per­haps at some stage I will replace the 5th gear to allow for more eco­nom­ic, qui­eter motor­way dri­ving as even though the per­for­mance is now a lot bet­ter, it is much loud­er than the oth­er T4 engines when run­ning at the high­er speeds due to the gear ratio. I may well also add an inter-cool­er at some stage. 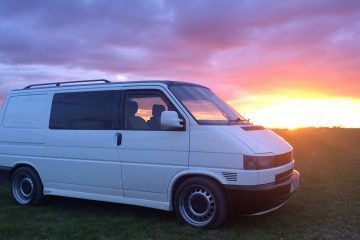 I’m often asked what is involved in run­ning my van on veg­etable oil, often with the expec­ta­tion that there is a lot of expen­sive con­ver­sion process­es involved but the answer couldn’t be more dif­fer­ent. At first I was very wary of mov­ing away from diesel, as well as the phys­i­cal impli­ca­tions of what it might do to the engine there was also the legal side of things but after some research I found that as long as no more than 2,500 litres a year is used then tax will not be applied so for most domes­tic use this would be fine. I also dis­cussed with some­body else I know who had been using it for years and that con­vinced me to go for it. The oth­er plus side is you can pre­tend you’re an eco-war­rior by using a renew­able fuel source. 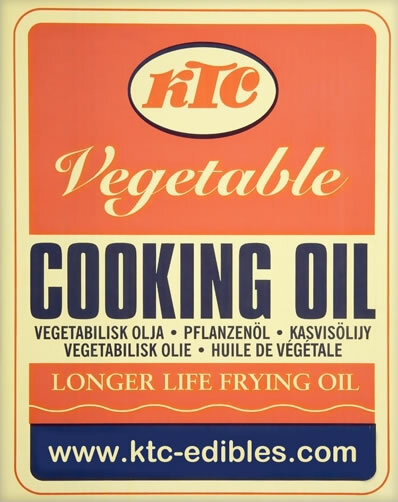 There are a few things to con­sid­er when switch­ing to using veg­etable oil though. First­ly, dur­ing the warm sum­mer months I find there is no prob­lem using 100% oil. There are plen­ty of places to pur­chase the oil, most super­mar­kets have fair­ly good offers. As I write this, Tesco are sell­ing 2×5 litres for £8.00 which works out at 80p a litre. Being a busi­ness own­er, I was able to set up an account with Book­er, they sell the KTC veg­etable oil in 20 litre con­tain­ers which works out at around 75p per litre. When first using the oil, it is advised to change the fuel fil­ter after approx­i­mate­ly 500 miles but after that the usu­al ser­vice inter­vals are fine. I do find that start­ing can be a bit more dif­fi­cult at times, par­tic­u­lar­ly on cold­er morn­ings, this being due to the oil being thick­er than diesel. Due to this, if I use veg­etable oil in the win­ter, I usu­al­ly mix with diesel 50/50. The cold start cable comes in handy on start up. As well as being more dif­fi­cult to start, the only oth­er issues I find are just the fill­ing up which takes time and if not care­ful, can be messy, par­tic­u­lar­ly if it’s a windy day. Also, nev­er try and do like I did first time and fill to the top, that makes a com­plete mess all over the dri­ve­way. I would always rec­om­mend putting an old blan­ket or some­thing to stop the splash­es get­ting on the ground. I usu­al­ly switch the igni­tion on (not the engine!) and as I fill, check the fuel gauge. 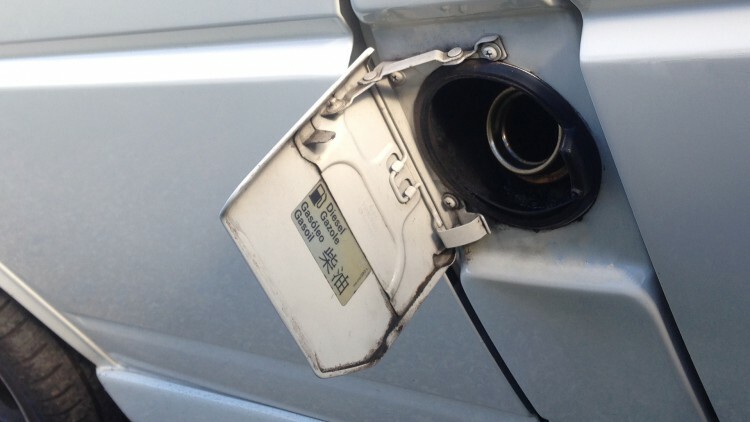 It’s also not rec­om­mend­ed to fill too high due to any spillage which may come out of the fuel cap when dri­ving. Once on the body work, it’s a pig of a job to get off and will attract unsight­ly dirt to the side of the van. If it does spill, I usu­al­ly remove with white spir­it. I have now dri­ven around 20,000 miles and to date, this has not caused any prob­lems with the engine which is clock­ing up 160,000 miles now. It’s prob­a­bly worth pur­gin with diesel every so often, I do less miles in the win­ter and part­ly due to it being cold and wet I tend to use just diesel. I use to think that I was not wor­ried about run­ning this engine into the ground as I would just then have an excuse to fit a 1.9TDI, but now I think I would like to stick with the 1.9TD. I also had the expense of a gear­box rebuild fair­ly recent­ly so need to get the use out of that. There are a few links list­ed below which also help to under­stand the process of run­ning veg­etable oil.